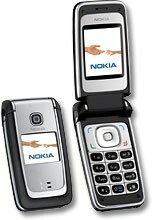 Nokia today followed last week's release of Bluetooth enabled entry level clamshells with a more advanced model. The 6125 is a quad-band GSM/GPRS (EDGE) clamshell with sleek, simple styling. Considering it's not a 3G phone or smartphone, the phone packs a large number of media features. In addition to a 1.3 MP camera, the 6125 has an FM Radio, a media player that supports MP3, AAC, WMA and MP4, and will be one of the first feature phones to ship with Macromedia Flash player. The phone also features Bluetooth, Infrared, USB and a MicroSD slot to move media on and off the phone. It is due out in the second quarter. HTC plans to exit the entry-level phone market moving forward and will instead focus its handset portfolio on high-margin devices. The company made the comments during a conference call with media to discuss its fourth quarter financial results. LG today announced the G6, its flagship smartphone for 2017, which is meant to compete with the Apple iPhone 7 and Samsung Galaxy S8. The G6 features a sleek metal-and-glass design that keeps the footprint at a minimum despite the large screen. If you forget about the #3 then I'd do the 6682 I love mine! We may luck up and see a S60 version. That would be great. Once you have a smartphone you never want to go back. According to GSM Arena, it does have EDGE. I thought Nokia models with "5" as the last digit were usually CDMA phones. 6255, 6235, 3155, etc. Guess they are breaking with convention. Nice looking phone from this info so far though, I would buy it.